Tom Wolfe’s The Electric Kool-Aid Acid Test (1968) is a perfect time capsule. Reading it today is like taking an acid trip in Mr. Peabody’s “way back machine”–it’s a frenetic, dizzying, eye-popping journey into the heart and soul of what would become known as the psychedelic era. 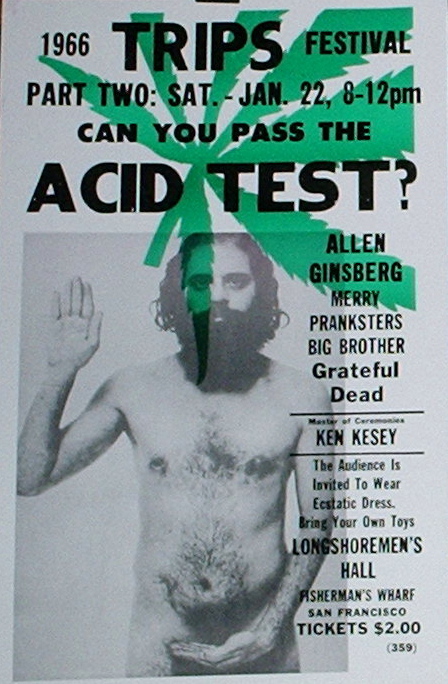 Acid Test is the ideal vehicle for glimpsing and vicariously experiencing the foolish/noble/brave/excessive experiment in living and consciousness that Ken Kesey and his band of followers (the so-called Merry Pranksters) ushered in. The hippie/psychedelic movement–and what it ultimately represented–has been fiercely debated for over four decades now. But there is no debate that the one indispensable chronicle of that era is The Electric Kool-Aid Acid Test. For many people nowadays, the hippie/psychedelic era is pretty much summed-up by the love beads and tie-dyed shirts and headbands they don for a Halloween costume party. But Wolfe’s book is a vivid reminder of how much more was going on back then. Yes, there was epic foolishness and epic posturing and loads of questionable, risky, even dangerous behavior . . . but there was also something uplifting and daring and even–can we say it now?–admirable about the whole crazy enterprise. Re-reading Acid Test in 2014, you realize that many of the hallmarks (and eventual clichés) of the hippie era were actually invented by Kesey and the Merry Pranksters. Not just the trappings, but the root essence of the era. This is all captured and distilled in Wolfe’s ground-breaking and still thrilling account. It’s impossible to write about Wolfe’s writing WITHOUT . . . starting to MIMIC HIS STYLE!!!!:::::::YEEEESSSS!! Wolfe has his detractors, but for those of us who buy into his approach and style, his prose is so much fun that it starts seeping into our pores. His writing bristles with energy and vitality . . . it wriggles on the page like a living thing. It’s so organic and tactile I found it hard to pick out short quotes to capture the essence of his style. His words swirl and swoop and dive and double-back and soar. Half the time, you find yourself just holding on for dear life. But exactly! The experience–that was the word! and it began to fall into place. . . .
And has there has ever been a more seamless match between subject matter and style than this book? I don’t think so. The SEEDS OF THE HIPPIE ERA were actually sewn–not at Woodstock in 1969, nor in the “Summer of Love” in 1967, not even in Haight-Ashbury in 1966–but much earlier . 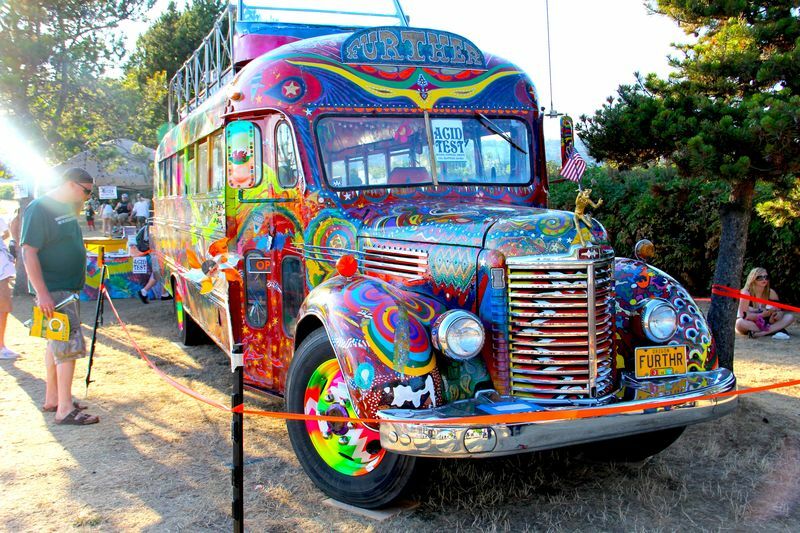 . . in the EARLY SIXTIES . . . . . . . . . . . . By the time the REST OF THE COUNTRY was hip to Kesey and the Merry Pranksters, their thing was ESSENTIALLY OVER!!!!! It’s amazing to realize that Ken Kesey was one of the very first in the whole world to try the new drug, LSD (years before it would become widespread and then criminalized). 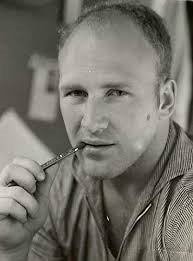 Starting in 1959, Kesey volunteered for a government-sponsored experimental program at the Veterans Hospital in Menlo Park, California in which he was given a number of “psychomimetic” drugs (including mescaline, cocaine, psilocybin, DMT, and, of course, LSD). It was LSD that Kesey found to be the most profoundly mind-altering. And the psychedelic era was abornin’ . . . It was a strange feeling for all these good souls to suddenly realize that right here on woody thatchy little Perry Lane, amid the honeysuckle and dragonflies and boughs and leaves . . . this amazing experiment in consciousness was going on, out on a frontier neither they nor anybody else ever heard of before. Later Kesey moved his group (what would later be called a “commune,” I suppose) to La Honda, California, a more remote location where this experiment in living would flower. And by and by, of course, the citizens of La Honda and others would start wondering . . . what are the ninnies doing? How to tell it? But there was no way to tell them about the experience. You couldn’t put it into words. . . . The citizens couldn’t know about the LSD experience, because that door had never opened for them. To be on the threshold of–Christ! how to tell them about the life here? The Youth had always had only three options: go to school, get a job or live at home. And–how boring each was!–compared to the experience of . . . the infinite . . .
KEN KESEY was one cool, LARGER-THAN-LIFE dude!!!! He was voted “most likely to succeed” in high school. Was a star wrestler for the University of Oregon (a BMOC as they used to say back in the day). A grad student in the creative writing program at Stanford. Respected and popular novelist with the publication of One Flew Over the Cuckoo’s Nest (1962). Wolfe paints Kesey as the classic charismatic leader: who leads not by force or bribery or trickery but simply because he is attractive and appealing and exudes . . . a larger-than-life aura . . . that makes others want to follow. Even though the Merry Pranksters were supposedly a purely democratic little club, there was little doubt that Kesey was their de facto leader. Kesey was the most magnetic person she had ever met. He radiated something, a kind of power. His thoughts, the things he talked about, were very complex and metaphysical and cryptic but his manner was back-home, almost back-country. Even while he was reeking with paranoia, he seemed to have total confidence. That was very strange. He could make you feel like part of something very . . . He had even given her a new name, Black Maria. . . . Many of the HALLMARKS (and what were to become the ENDURING CLICHES) of the HIPPIE ERA were actually . . . . GET THIS!!! . . . INVENTIONS of Kesey and the Merry Pranksters!!!! YESSS . . . Ever wonder where the Haight-Ashbury scene actually came from? 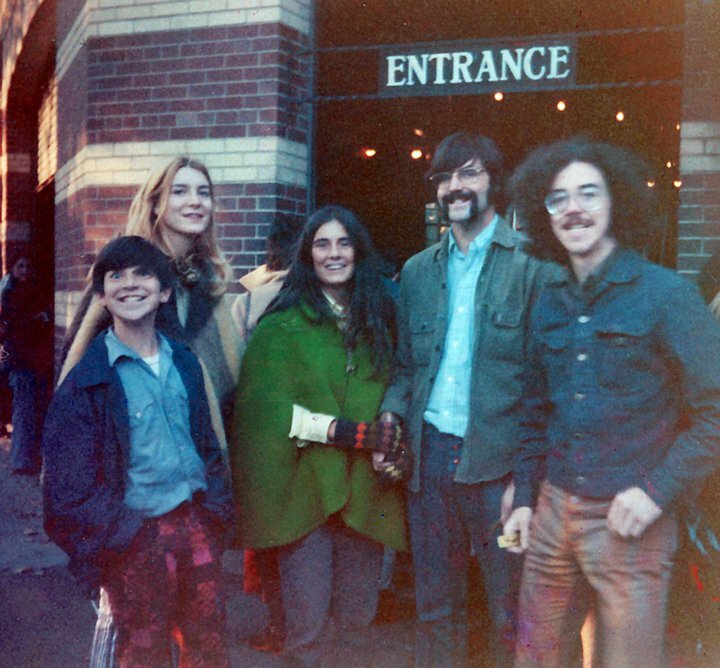 The seeds of the San Francisco’s “Summer of Love” in 1967? Day-Glo poster art? Strobe Lights? “Acid rock” and Edge City bands such as the Grateful Dead, Big Brother and the Holding Company, Jefferson Airplane? Amoeba light shows? Black lights? Brightly painted VW mini-vans tooling around the country crammed with freaks and freakettes??? Kids dressing up in tie-dyed shirts, headbands, American Indian garb, costumes of all sorts? Communal living? And, of course, the LSD experience as the main portal to a new consciousness? You can thank (or blame–depending on your point of view) Ken Kesey and his band of Merry Pranksters for virtually all of the above . . . The Watts test in L.A. [in February, 1966], coming on top of the Trips Festival in San Francisco, had caused the fast-rising psychedelic thing to explode right out of the underground in a way nobody had dreamed of . . . This new San Francisco-L.A. LSD thing, with wacked-out kids and delirious rock ‘n’ roll, made it seem like the dread LSD had caught on like an infection among the youth–which, in fact, it had. Very few realized that it had all emanated from one electric source: Kesey and the Merry Pranksters. 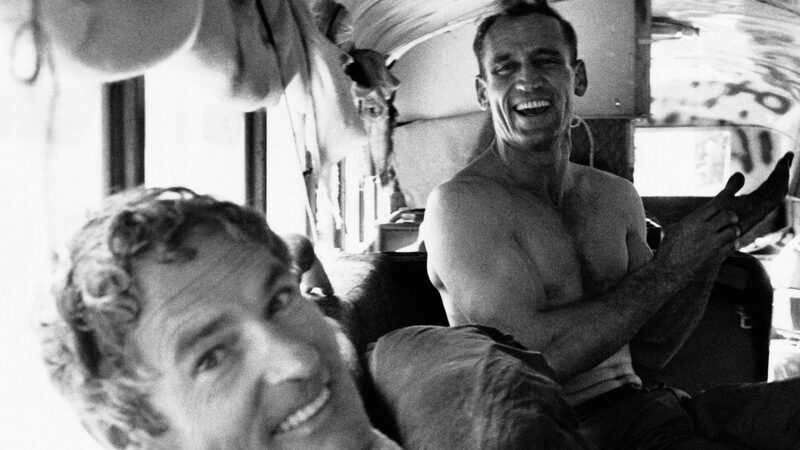 The Merry Pranksters’ fabled bus trip of 1964 represents the logical culmination of Kerouac’s “ON THE ROAD” adventures. . . . . . Amazingly, NEAL CASSADY–the hyper-active, chain-smoking, pill-popping, lunatic driver–is a MAJOR FIGURE in both counter-cultural road stories!!!!!! Imagine you are a farmer sleepily driving his tractor down the road somewhere in the mid-west in the summer of 1964. Suddenly you come upon . . . a 1939 International Harvester bus covered in Day-Glo paint and festooned with the most vibrant, eye-popping images you have ever seen. At the wheel is one Neal Cassady (the figure on whom Kerouac’s Dean Moriarity was based), driving like an amphetamine-fueled madman (which he was). Meanwhile, assorted weirdly costumed . . . FREAKS (there really is no other word) . . . are hanging out of the windows of the bus, hooting and gesticulating, while one of the band, movie camera in hand, is shooting the entire scene as the bus barrels past. The front of the bus has a sign that says FURTHUR. As it rumbles on by, the sign on the rear bumper reads, CAUTION: WEIRD LOAD . . . What to think? Wolfe captures the weird and wonderful adventures of the Merry Pranksters as they made their epic 1964 cross-country road trip. By-standers didn’t realize that they were seeing the future rumble by, weren’t quite prepared for what else would be coming down the road in the next few years. Even Timothy Leary and his east-coast LSD disciples didn’t quite know what to make of these madmen/madwomen. They were pretty cool towards Kesey and his ragged band when the Pranksters showed up uninvited to Leary’s sedate and tranquil Millbrook, NY retreat. But really, who could have known how to react to Kesey and the Merry Pranksters?
. . . nobody really comprehended what was going on, except that it was a party. It was a party, all right. But in July of 1964 not even the hip world in New York was quite ready for the phenomenon of a bunch of people roaring across the continental U.S.A. in a bus covered with swirling Day-Glo mandalas aiming movie cameras and microphones at every freaking thing in this whole freaking country while Neal Cassady wheeled the bus around the high curves like super Hud and the U.S. nation streamed across the windshield like one of those goddamned Cinemascope landscape cameras . . . The Electric Kool-Aid Acid Test still has particular resonance for me because back then, I was on the edges of the whole hippie scene. But never dead center. Why? Mostly because of my age and temperament. I was a little too young to be a real “hippie.” (I was only 12 when the famous “FURTHUR” bus trip happened; only 15 during the “Summer of Love.”) Even when I went to Woodstock, it was only because my older sister, Liz, was kind enough to let me tag along with her and her college friends (it was the summer before my senior year of high school). So the hippie life appealed but hard-core hippies tended to be a somewhat older crowd. And temperamentally, I guess I was a little too straight. My roots were working-class, so while others kids might have felt comfortable blowing their parents’ tuition money and running off to San Francisco, I was busy working my way through college. Here’s what I and some of my family looked like back then. Suffice it to say we’ve all had better hair days. 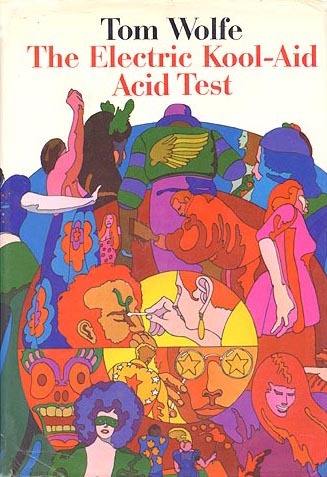 So for all you former hippies out there, or quasi-hippies like me, or hippies in spirit (like some of my younger acquaintances)–make the effort to read The Electric Kool-Aid Acid Test. It’s a LONG, STRANGE TRIP . . . but well worth it.